Concept, user experience, user interface design, and branding for a mobile application for exploring cities in a new way. 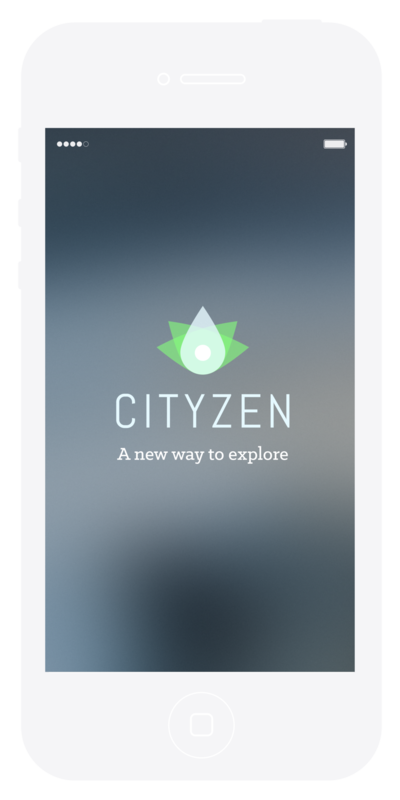 Cityzen presents the city in a minimalist map view, encouraging users to get lost, look around, and follow whatever piques their interests. The logo is a spin on the location pin, inspired by the lotus flower. The application centers around the 'walk' function, which allows users to start their walk around the city. The walk is complemented by three other core functions: actions, POIs, and rendezvous'. Actions are essentially instructions or tasks that help guide users around. These are presented as cards that can be skipped or completed. 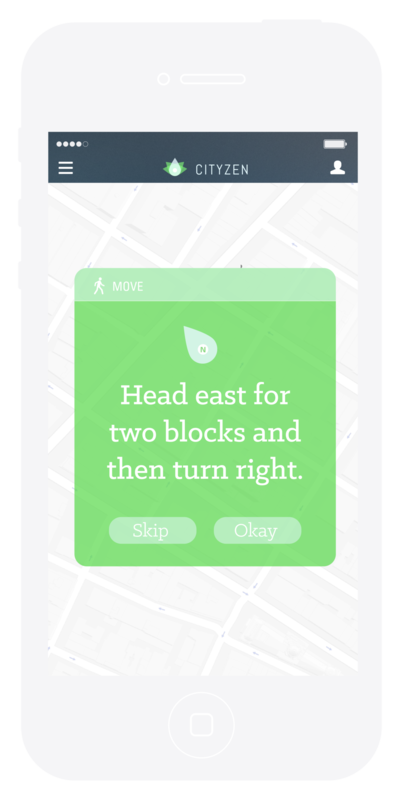 As users wander with the guidance of these action cards, they may come within range of points of interest or another 'cityzen' or user. POI cards are a way for users to learn more about their surroundings when they stumble upon a site that is significant or interesting. The rendezvous function gives users the option to meet up with other 'cityzens' nearby for a more social experience. Users will always be prompted with the question, "What do you want to do today?" upon opening the application, which allows them to specify time or destination constraints for their walk. First-time users will be directed to a walkthrough of the app's functions before being prompted to register their user information. The main map view of the application is complemented by a local and a global side menu. The local side menu allows users to manage their current walk, showing their route, a summary, and allowing them to end their walk. 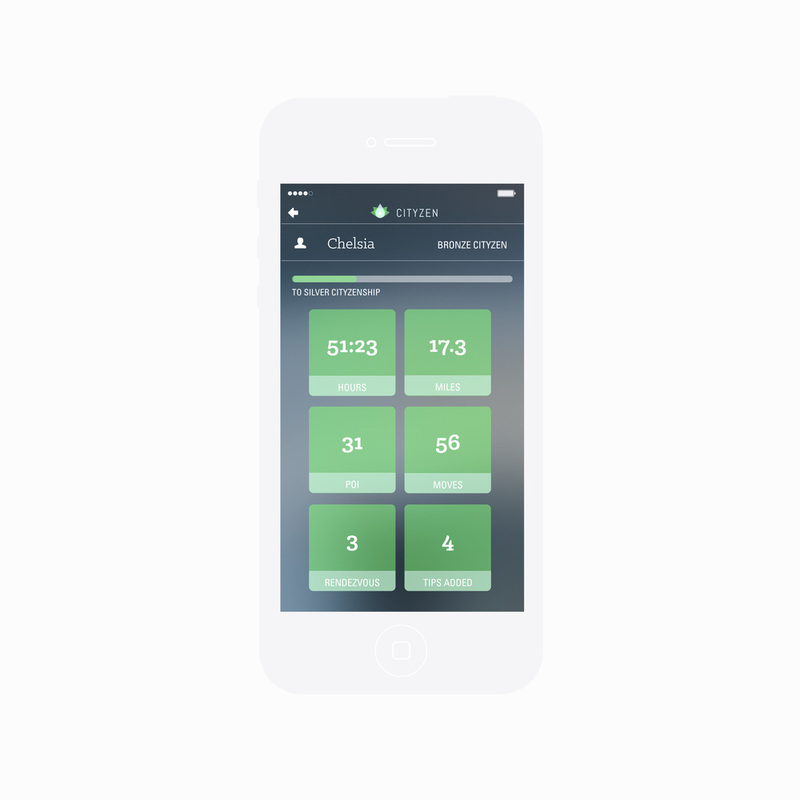 The global side menu provides users with customization options, detailed information about their overall activity with a personal profile, an activity log of their walks, favorites, and pins. Details of the new user walkthrough, prompt, main walk screen, local and global menus, action cards, rendezvous, and point of interest cards. The user experience is essentially an endless walk guided by action cards that may or may not be punctuated by point of interest cards and rendezvous' with other 'cityzens'. Users can end their walk at any time. User (also known as a cityzen within the app) Maya has a free afternoon in New York after having Saturday brunch with a friend at Chelsea Market. Maya has just moved into a Williamsburg loft a few months ago, and spends most of her time out in Brooklyn or around Greenwich Village, where she works at an off-Broadway theater. The weather is just right and she’s left her bottomless brunch in an elevated mood. Maya is feeling a little adventurous and wants to explore Chelsea. She has the option to specify a set amount of time to wander for, or to set a location to end at. Since Maya doesn’t have any later engagements today, she taps ‘Wander’ for a walk that is constraint free. Her first action card pops up and directs her in the easterly direction for two blocks. The compass needle tells her which way is North. She hits ‘Okay’. As she starts moving east, the action card minimizes, revealing a minimalist map with her location, the compass pinned to the top of the screen, and the outlines of streets and buildings. The map will show main street names, region names, bodies of water, and green space, but does not reveal detailed names of smaller streets or buildings. As she walks, Maya sights an interesting mural done by a street artist whose work she’d encountered in Berlin. To remember this location, she drops a pin and names it “Berlin Street Artist.” She then takes a photo and makes a note within the app, which will clip it all together within this walk. After moving on from the mural, her phone vibrates to notify her that there are points of interest within range, which appear on the map if she is within 0.3 miles of one. She decides to move towards one. Maya successfully navigates herself to the Point of Interest, which is Frank Gehry’s IAC Building. She quickly browses through the carousel of images and swipes to learn more about the building. When she’s done she walks around the base of the building and notices a number of people milling in and out of the adjacent building. She takes a peek and realizes that it’s a gallery show open to the public. She walks in a grabs a pamphlet—it’s Ai Wei Wei’s work being displayed—and wanders through the exhibit into the courtyard, where many others are gathering. In the courtyard she catches a unique glimpse of the photogenic IAC building next door and is compelled to take a photo. After snapping the perfect shot, she taps the share button to connect with Instagram and upload her photo #galleryhop. Seven likes in 1 minute? Maya is satisfied and moves back outside, tapping the check for a new action card. Maya’s new task is to follow someone walking a dog for 3 minutes. “Okay, that’s a little creepy,” she thinks. As she’s about to tap ‘Skip’ for a new action card, she catches a glimpse of a sharply dressed elderly man walking a particularly fluffy Shiba Inu. In that moment she changes her mind. “What a pair to follow,” she thinks as she nonchalantly pivots and starts after them. Just a minute in, Maya notices that she’s nearing another POI but the man and his dog are moving towards a nicely shaded park. Maya is feeling a little tired and thirsty, so she ignores the POI and nestles into the trunk of a nice shady elm tree, still watching the man and his dog. She spots a street vendor and purchases a ‘Watermelon Bomb’ drink after receiving recommendations from the enthusiastic guy manning the cart. It’s a delicious mix of watermelon, mint, with a hint of lime and a little spice. Three sips in, Maya is sold. She drops a pin and labels it ‘Watermelon Bomb has Aplomb’. Maya is enjoying her leisurely afternoon, contently lounging under the tree with her Watermelon Bomb. Her attention has shifted from the man and his dog to a particularly chubby kid playing catch with his dad. She’s zoning out a little when her phone vibrates with the prompt: ‘You’re within 0.3 miles of another cityzen. Would you like to meet up?’ Maya’s been sitting there daydreaming for a good 40 minutes now, so she figures, ‘Why not?’ She taps yes and waits for the green light. Luck is with Maya this sunny afternoon. It looks like fellow cityzen Sarah is also feeling social. A rendezvous action card comes up telling Maya to use her location on the map to find Sarah. She taps ‘Okay’ and is ready to go. The card minimizes to reveal the map view, which now shows a purple dot – cityzen Sarah – north of Maya. It’s up to the two of them to move towards each other given their locations and orientations. Maya and Sarah meet up with no trouble after a few minutes, and decide to grab a snack together from a bakery nearby. They have a nice little chat, finding out that both of them are interested in theater. The two exchange numbers and head toward the 23rd St. ACE stop, where they head their separate ways. Maya is done with her adventure for the day, so as she waits for the downtown train she navigates to the local side menu to manage her walk. She takes a quick look at her route overview, which provides a map of the course she’s taken and a list of her actions and points of interest, with her photos and pins clipped along the way. Satisfied, she ends the walk from the side menu. Maya’s wondering about the sound and vibration settings, so she wanders over to the global menu to take a look at her customization options. She turns off the sound, since the vibration was enough for her on today’s walk. This is Maya’s 3rd or 4th walk, so she’s curious about what she’s done so far. She navigates back to the global menu to take a look at her profile. Her profile provides a summary of various stats: time spent walking, distance covered, number of walks, number of POI, and more. Maya’s at ‘Bronze Cityzenship’ now and steadily on her way to a ‘Silver Cityzenship’. Maya is happy with her progress and exits the app.